The International Agency for Research on Cancer (IARC) is fraught with transparency issues. IARC often claims its carcinogenic assessment process, known as the Monographs Program, is transparent, primarily because it uses only publicly available studies. According to Kathryn Guyton, Senior Toxicologist at the Monographs Program, IARC’s process is completely transparent and reproducible because, “We only use publicly available data….This is the cornerstone of the Monographs scientific procedures.” However, the independence of that research base comes into question when compared to the more diverse sources regulatory agencies use in their evaluation of chemicals. Below are several key examples that show how IARC lacks transparency. IARC claims to be transparent, but it is not. IARC actually goes to great lengths to keep its Monographs process and the justifications for its conclusions a secret. 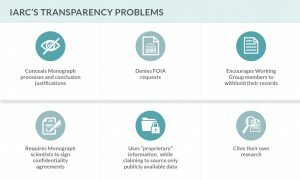 For example, the U.S. National Institutes of Health (NIH) — a major funder of the Monographs Program —recently denied a Freedom of Information Act (FOIA) request for documents related to Monograph 112. The request was sent to U.S. government workers who participated in the Monographs Program, and requested documents that would have been created after the Monograph was drafted, as well as correspondence between Working Group members and non-IARC participants. NIH denied the request in full, arguing that all such documents are not subject to U.S. transparency laws, because IARC claims the documents belong to them. In fact, IARC actually encourages Working Group members to resist records requests by withholding their records pertaining to the Monographs process. In addition, Monograph participants are required to sign a confidentiality agreement promising not to disclose information about IARC’s deliberations and conclusions. IARC also does not require disclosure of experts who review their own work or that of their close colleagues. As such, this is now common practice. Between 2012 and 2015, 61 scientists worked on Monographs that cited their own research.